This muscular relaxing Aloe Vera Relaxing Gel with Warm/Cold effect integrates in its formula moisturizing power of Aloe Vera with the special properties of Mountain Tobacco (Arnica Monata), Graple plant extract and menthol to improve local blood microcirculation and to treat injuries or muscle pains and calm tired legs and feet. Now in travel size (100ml) so you can take it wherever you go! For orders below 45 €, shipping costs are 6.95 €. On orders from € 45, FREE SHIPPING. Delivery time between 4 and 7 working days. For orders below 45 €, delivery costs are 3.95 €. Delivery time 3 working days. A: Germany, Austria, Belgium, France, Holland, Italy, Luxembourg, United Kingdom, shipping costs 9,90€. For orders over 70€, FREE SHIPPING. B: Denmark, Hungary, Poland, Czech Republic, shipping costs 14,90€. For orders over 80€, FREE SHIPPING. C: Bulgaria, Croatia, Estonia, Finland, Greece, Latvia, Lithuania, Romania, Slovakia, Slovenia, Sweden, shipping costs 29,90€. For orders over 140€, FREE SHIPPING. For orders over 270€, FREE SHIPPING. Delivery times between 8 and 11 working days. This muscular relaxing Aloe Vera Relaxing Gel with Warm/Cold effect integrates in it’s formula Aloe Vera’s moisturizing power with the special properties of Mountain Tobacco (Arnica Montana), Graple plant extract and menthol to improve local blood microcirculation and to treat injuries or muscle pains and calm tired legs and feet. - Soothing for muscular fatigue, tired legs and feet, sore sinews and joints, sport massages, sprain and back-ache. - Parabens and paraffin wax free. - Apply small amount to the sore area massaging in with circular movements until completely absorbed. - Can be used several times a day watching that skin does not get irritated. - Do not apply on wounded / damaged skin parts or around the eyes. Aloe barbadensis Leaf Juice, Alcohol Denat., Maltodextrin, Glycerin, Camphor, Aqua, Menthol, Carbomer, Triethanolamine, Harpagophytum Procumbens Root Extract, Arnica Montana Flower Extract, Phenoxyethanol, Disodium EDTA, Ethylhexylglycerin, Propylene Glycol, Citric Acid, Potassium Sorbate, Sodium Benzoate, CI 42090. Estoy contento porque me ha aliviado los dolores de espalda. El efecto frío calor que tiene funciona. 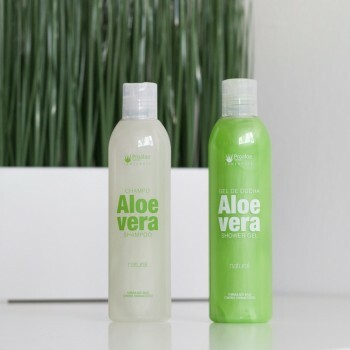 97% Pure Aloe Vera Gel 250ml is a product of superb quality, due to the large quantity of nutrients and active ingredients found naturally in Canary Islands Aloe Vera plants. This shower gel cleanses delicately, preserving skin from dryness and maintaining its optimum level of hydration. Natural formula, free of parabens or paraffin waxes, for soft, elastic and moisturized skin. Now available in 250ml size! The combination of Aloe Vera (98%) with its moisturizing effect and Rosehip Oil with its powerful regenerating effect, makes this gel a top quality product, indicated for all skin types, including dry and damaged skin. This shower gel cleanses delicately, preserving skin from dryness and maintaining its optimum level of hydration. Natural formula, free of parabens or paraffin waxes, for soft, elastic and moisturized skin. The combination of Aloe Vera, with its moisturizing effects, and Rosehip Oil, with its powerful regenerating effects, makes this gel a top quality product, indicated for all skin types, including dry and damaged skin. This muscular relaxing Aloe Vera Relaxing Gel with Warm/Cold effect integrates in its formula moisturizing power of Aloe Vera with the special properties of Mountain Tobacco (Arnica Monata), Graple plant extract and menthol to improve local blood microcirculation and to treat injuries or muscle pains and calm tired legs and feet. If you want to receive promotions and exclusive offers, subscribe to our newsletter. I have read and accept the Legal Notice. © 2016 Developed by 2mcgroup and cocosolution.